Vander Lodge - Wifi access and PET FRIENDLY!!! Perfect Twain Harte Summer Vacation Cabin. Cute as can be and less than a block to the lake! One Story, 3 Bedroom, 2 Bathroom. There is a three night minimum on this house. Arsenio Cabin - A private space with the decor of a retro mountain lodge with unique pieces throughout. This cabin is a GREAT example of what a Twain Harte cabin should look and feel like. One level living in this beautiful Twain Harte cabin. Up approximately 8 stairs to the great porch/deck. Shaded covered porch in the front of the house, sunny deck on the side of the house...the best of both worlds. Enter into the living room and your breath will be taken away when you see the beautiful floor to ceiling stone fireplace. There are cozy couches to enjoy your relaxing time and a beautiful long wood table for dining. So much attention has been paid to the decor in this home. One of the couches is a comfy hide-a-bed. 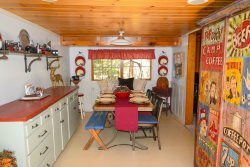 The kitchen is open to the living/dining area and has great counter space for cooking up your favorite potato salad in the summer. This is the perfect home to entertain in, be it your family or your closest lake buddies. There are three bedrooms, two have great queen size beds and the third has two singles. There are two full bathrooms, both with showers and a washer and dryer. If you want the real Twain Harte experience, come to the Vander Lodge. So close to the lake that you can come home for lunch...or perhaps a nap. Twain Harte Lake Privileges, one block from the lake. PET FRIENDLY with prior written permission from management team. Pet must be crated in left in the cabin alone. Linen service is not included with this rental.